This much belated franchise-resurrection trips in execution due to unit pathfinding issues and the lack of multiplayer. 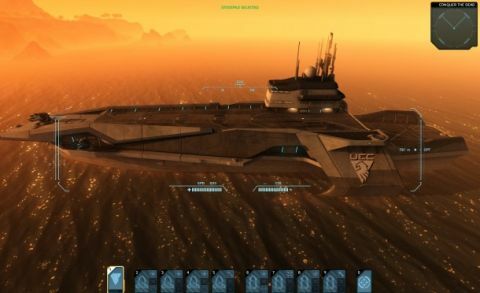 I thought I was having an off-kilter dream when I heard that the developers of military sim Arma were making a follow-up to Carrier Command, the cheesy 1988 sci-fi game about piloting an aircraft carrier. It turns out I wasn't dreaming, but Gaea Mission isn't quite the dream outcome. Two modes are available: a story-based campaign built around a bland, futuristic war where the sides are mostly differentiated by the colour of their units, and a 'strategy game' option that lets you set up your own map, tweaking the difficulty in a variety of ways. Both boil down to capturing and defending islands that provide you with resources to upgrade your carrier and build units – a fleet of up to eight amphibious walrus tanks and flying manta gunships. The ultimate objective in both cases being to confront and defeat an enemy carrier. The campaign is a decent tutorial, but burdened by forgettable characters and a story you'll often have to be reminded exists. The main focus of Gaea Mission seems to be the strategy mode, which on the surface looks like it will be highly replayable. There's just one problem: the core tactical mechanics make you want to walk away from your PC and break things. Gaea Mission has some of the worst, Yakety Sax-worthy unit pathfinding I've seen in years. You can only pilot one vehicle at a time, while your other seven are directed using attack, move, and follow commands. Your vehicles' interpretations of these commands are hilarious at first, but eventually made me want to construct scale replicas of each just to take a sledgehammer to them. Often, while piloting a walrus, other walruses (walri?) would drive directly into a ravine and get stuck, allowing enemy mantas to shoot them like walruses in a barrel. On more than one occasion, they would back up directly into me at full speed as I was lining up a shot, or miss a waypoint by a few inches and neurotically insist on making a six-point turn to go back and hit it instead of carrying on. Mantas are no smarter. The first time I instructed one to dock with my carrier for repairs, it interpreted that as 'crash unceremoniously into the ship's hull and explode'. They often interpret attack commands as 'hover around with your crosshairs on a target and hold fire until it shoots you down'. This is especially irritating considering the jittery manual controls make it almost impossible to hit anything while piloting a manta directly. Multiplayer is woefully and head-scratchingly absent. It seems like a no-brainer: the strategic side of the game is almost screaming to be a deep and engaging competitive experience. It would also have enabled competent humans to control all the vehicles in eight-on-eight skirmishes, circumventing the awful AI. But no.